I know it's been a few weeks since I've blogged and I'm sorry I left you all so abruptly. Sometimes life gets crazy and you can't remember which way is up. Between a busy work schedule and busy weekends working on the new house, my blogging sadly got pushed to the side and I'm sorry. I missed blogging and I missed all of you. With that said, I just want to say I'm sorry and that I'm back. With the temperatures constantly dropping and having to walk across campus I've had no choice but to pile on the layers. 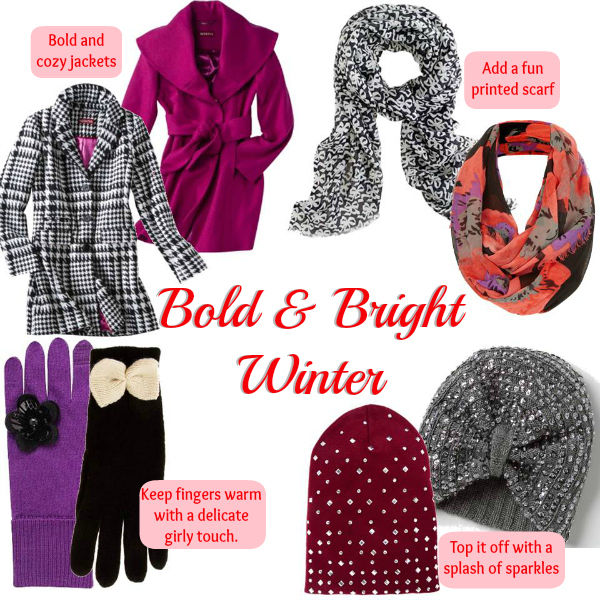 A great way to still look chic while keeping warm is to wear bright, bold, and fun pieces like these options here. Don't be afraid to add some sparkles or bold prints when wearing solid colored jackets. Also, gloves with girly details is a fun way to feel glam. These Kate Spade gloves even have special tech pads in the fingertips so you can still use your phone without freezing your fingers. Glad to have you back in the blogging world!! :) Love both jackets! That fuchsia coat is everything!